I am very sorry to report that on June 28, 2016, Toby James crossed the Rainbow Bridge. He was just past his 11th birthday, which is a very long life for a Doberman. He was blessed with the best loving and care from his friends and family. He will be deeply mourned. 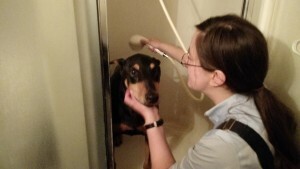 Thank you, everyone, for sharing in his crazy Dobie life. 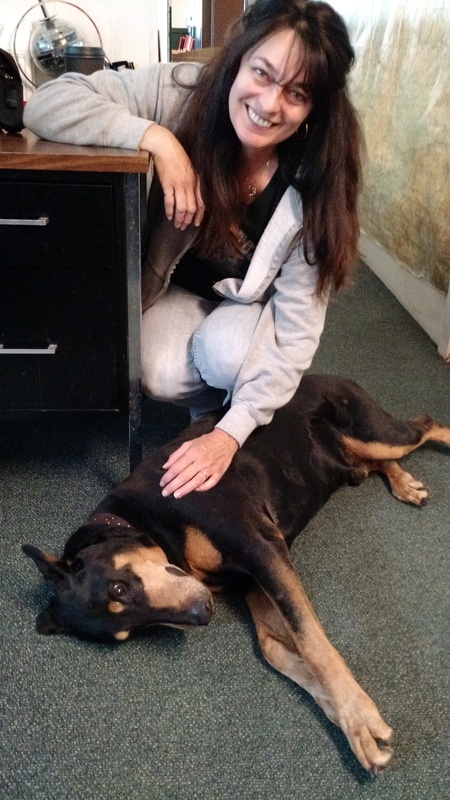 If you wish to honor Toby, please consider making a donation to your local animal shelter. I know it’s been a while – hope everyone’s Spring (or Autumn) has been good. We are enjoying life here at the seaplane base, and I am delighted to see my pals, the turtles, back here. But enough about that – we have celebrations! Our dear Yvette earned yet another pilot milestone: her Instrument Rating! 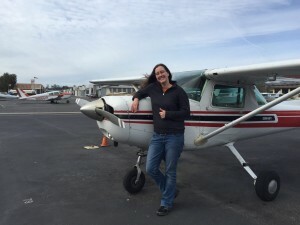 She’s been training with her CFI aunt Judy at CP Aviation in beautiful Santa Paula, California. 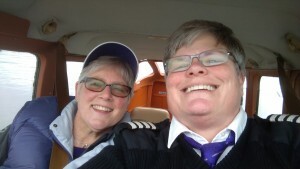 Yvette has, of course, her Commercial Pilot license already, and this enables her to do even more with that license. She can fly extended scenic flights for us, for example. So, we are very proud of Yvette and her accomplishments! Meanwhile, I have another click on the old TobyOdometer – on May 21, I turned 11 years old. I’ll admit, I’m feeling a little bit more like an older dog these days, but I still love to play, and I still love meeting new friends all the time. 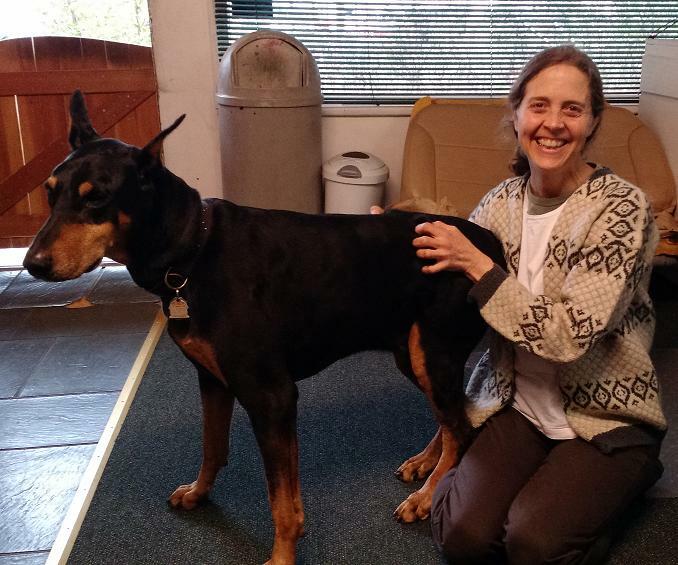 My mom and dad continue to take me to doggie physical therapy, acupuncture, and water therapy, and it helps a lot. Still feeling cool! So, stop on by our place – the weather is great, and we are ready to take you flying! We are reorganizing our base area too, so stop by to see the changes. Even though it’s a relatively quiet time of year for us, we are keeping busy down here on Lake Union. I want to introduce you to Joseph, who is helping us out on the weekends. There he is, up on the roof! Joseph is a tax accountant by day, and seaplane base man-of-all-trades on the weekends. He can patch the roof, fuel the airplanes, build things for us… and keep me company, too! Joseph stopped by one evening to talk about learning to fly, and before we knew it, he started coming around to give us a hand. 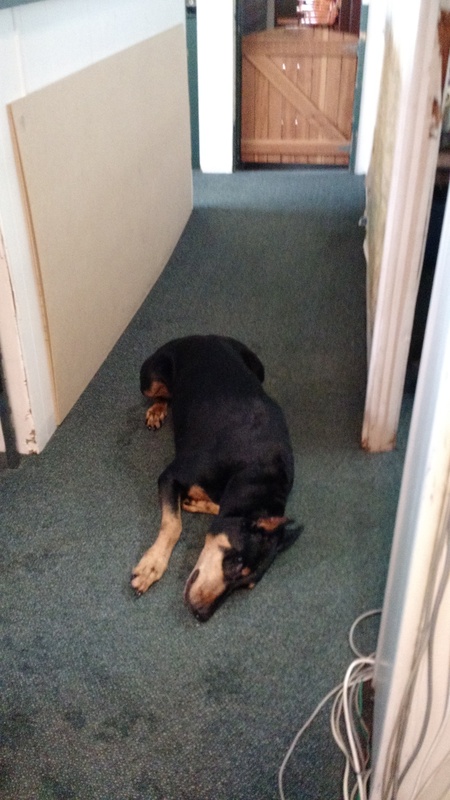 While we are working on getting the C-172 back up and running, he is helping out around the place. 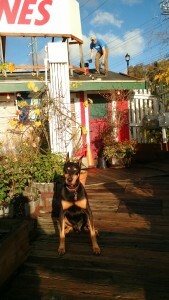 Speaking of building, my “dad” had a ramp built from our upper walkway down to the dock area. It makes getting to and from the airplanes a lot simpler for everyone! We have been using steps to get down to the floating docks, and when Lake Union’s water level changes, it changes the height of our steps, too. A ramp makes it so much easier for everyone. 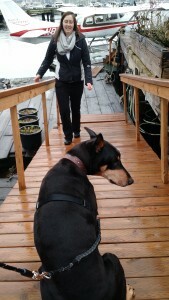 Here I am, inspecting the ramp with Yvette. By the way, we can accomodate persons of nearly any physical ability on our flights. If you or a loved one is differently-abled (for example, a wheelchair,) please don’t let that stop you from booking a flight with us. Just call or email us, and we will figure out how to make it work for you! Thanks, everyone, and hope to see you soon! 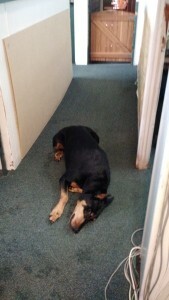 It’s been a really busy summer – a dog hasn’t had any time to write a blog, in fact! 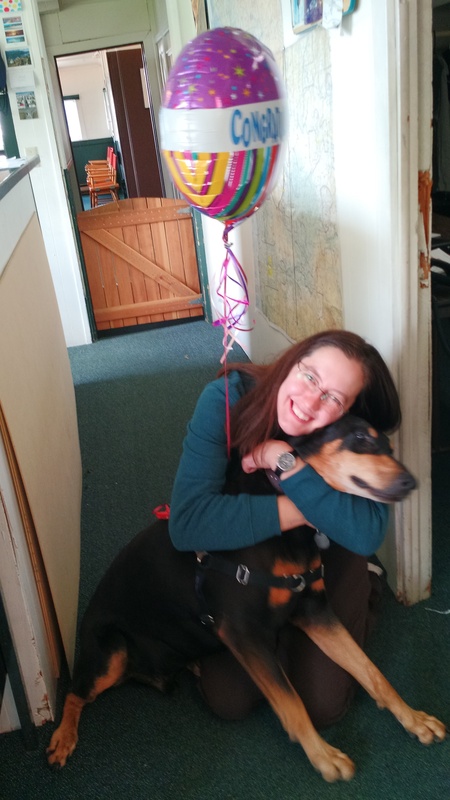 But we wrapped up summer in the most exciting way – our dear Yvette is now a Commercial Pilot! That means that when you come to our place to take a scenic flight, Yvette will now (most likely) be your pilot! This is really special, you guys. 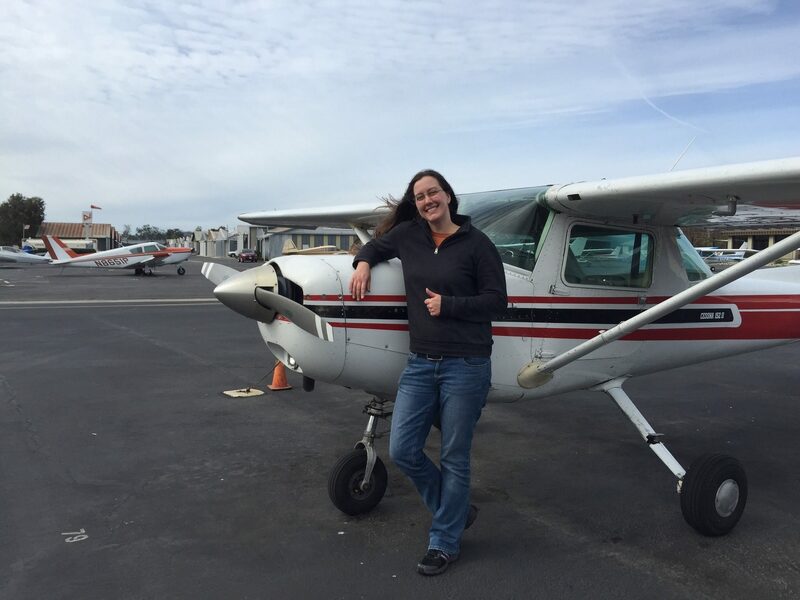 Yvette learned to fly here at Seattle Seaplanes: she took her first flight lesson with us, and she stuck it out for her Private license. 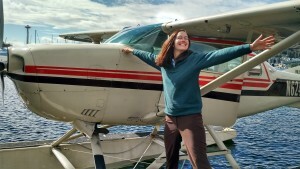 She went on to get a land plane rating, too, but her heart is (and has always been) with seaplanes. She’s part of our family, and that makes me extra proud. If you’re curious about what it takes to become a Commercial pilot, or what the differences are between pilot certificates, here are the specs. Basically, you start as a Private pilot, gain some experience, then do some advanced training and bookwork (which Yvette aced, by the way) for the Commercial. So, come see us! And congratulations to Yvette! Guess what? 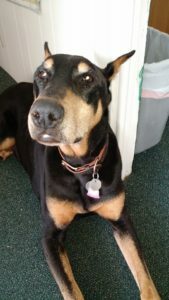 On May 21, I am 10 years old! Here’s a picture of me with my brothers and sisters when we were just a few months old. I’m the one not looking at the camera, ‘cuz I was a little shy. I’m not shy any more! You know, “dog years” and “people years” are measured a little differently. 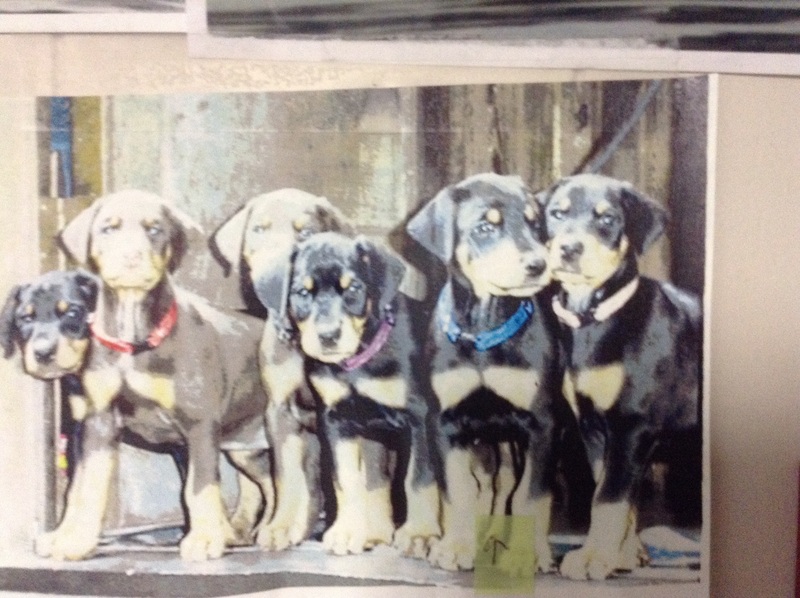 According to Cesar Millan, the “Dog Whisperer“, I’m about 53 in human years. Or, according to some other calculations, I would be in my mid-60s if I were a human. What I know is that I feel great! And I have a great life. I’m happy to be starting another decade! My friend Athens…. my friend Yvette’s mother! It’s starting to get busy down here at the lake. And we’ve been lucky – we’ve had visits from some wonderful friends. And, I’ve started water therapy for my arthritis! First things first: Yvette’s mom, Athens, came to visit us recently. She’s been here before, and it’s always great to see her. She went on a scenic flight with my friend Kit, and just raved about it afterwards! Athens is a really talented woman. She has a couple of web sites, athensabell.com and homegrownhighways.com – check ’em out! Lots of pictures, videos, stories, musings, about life, beauty, gardening, banjos (yes, really!!) You’ll enjoy the trip! For the purple and the gold team!! Candie has worked for many years at their school, Carroll College, and was in town on college business. Kit took her for a ride around Seattle. Now, about that water therapy….. well, I hate to admit it, but I’m getting older, and with age comes a bit of arthritis. 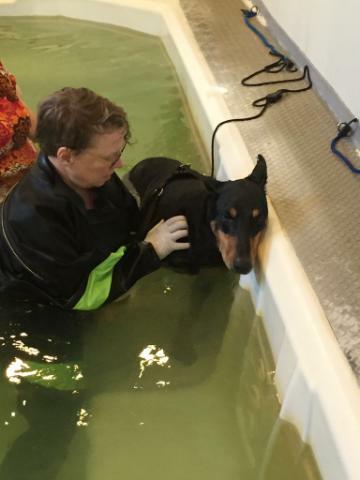 My “parents” found a clinic here in Seattle where they do hydrotherapy with dogs to help ease arthritis. So, about once a week, I’m off to the pool for exercise and a massage! I do like it, despite what it looks like here, haha! And they told me that I’m the strongest Doberman they’ve ever worked with. Not that I’m bragging or anything….. So, why don’t you stop by and ask me how my therapy’s going? And take a scenic ride like my friends Athens and Candie? Hope to see you soon! And it feels so good to roll afterwards! Come see us at Lake Union! We’ve had a very mild winter here on the lake. While our friends on the East coast received more than their share of snow, we’ve gotten practically none in our mountains. The flowers are all about three weeks’ ahead of schedule, and thoughts of flying are in the air! Crista has seafaring blood in her veins: she lives on a boat here in Seattle with her beau, and she comes from Cape Cod out in Massachusetts. 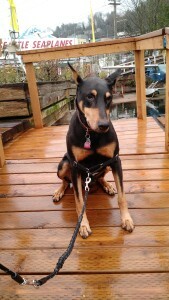 She’s learning the ways of the seaplane here. So, now’s a great time to stop by to see us here on the lake, and to take one of our flights! See how green the Emerald City is *this* year. 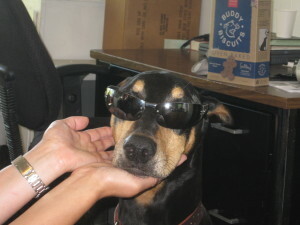 And say Hi to Crista! 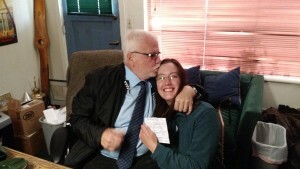 My friend Yvette just passed her Private Pilot Checkride! YAHOO!! Every checkride here is special, but this one is even more so. Yvette started training with us a couple of years ago, and for the last year or so, she’s been working here in addition to training here. 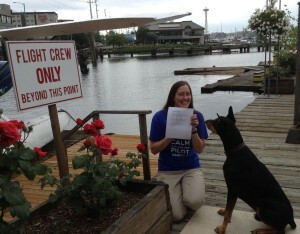 She’s an integral part of our Seattle Seaplane family, and I just couldn’t be more proud! Yvette was even featured in the most recent issue of the Seaplane Pilots Association’s magazine, “Water Flying.” She wrote her story for the magazine, about going to southeast Alaska, taking her first floatplane flight, and immediately falling in love with seaplanes. Today, she’s a licensed pilot, certified to fly Single Engine Seaplanes. Wow! 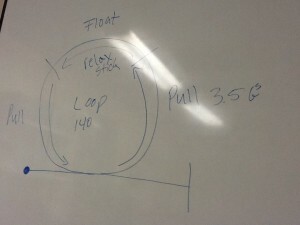 There are very few pilots who earn their initial private certificate in a seaplane. And we here at Seattle Seaplanes are one of the very few places in the world where you can do it. Yvette saw it through from start to finish, smiling all the way. 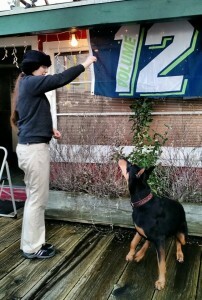 When you’re in Seattle, stop by our place to congratulate Yvette! We are all very, very proud of her.